On the way to the guardhouse, Rowaine talks to Feren about a conversation he had at the Blackened Knife. Karen thought the neogi might be using some form of aquatic creature as underwater transportation. If so, they could therefore have travelled much farther away than the underwater market the party discovered - particularly if the creatures conferred upon their riders the ability to breathe underwater. With the search area massively widened, Feren and Rowaine conclude that the only way they might have a hope of finding out where the neogi are going would be to reacquire and follow them again. Feren points out that the neogi don't seem to frequent the markets very often; opportunities may be rather thin. Rowaine asks Troll whether he has access to any spells that allow others to breathe underwater. He does not. "Sir," Rowaine adds, "The neogi have a market belowdecks. We have good reason to believe that they are selling and buying things more than that which is on display. I would like to know the extent of their operation. There are a lot of insinuations going on involving the neogi, and there are some odd things happening. I would like to at least rule out the neogi's involvement. If they are here and are peacable and simply going about their business, then I say let them be. But if they are not, if they are here for nefarious purposes, then we need to know, and quickly. Sir, I want to only work withing the bounds of your regulations. I understand that the guard is responsible for keeping the peace here. But that being said, we are capable at dealing with these sorts of situations. I ask that you either take this information and investigate it yourselves, or perhaps in the interests of expediency, allow us to perform that operation for you." The guard reiterates that the only suspicion surrounding the neogi at present is based upon their reputation, not their deeds, and that the guard cannot sanction sending in outside force. Arrian asks whether they might perhaps accompany a guard-led force, but the guard thinks it best that they take it from here. Both Rowaine & Arrian think that guard does not trust their words. Rowaine reasserts her and her party's willingness to help, reveals the loaction of the neogi market, then leaves it at that. The guardsman thanks her for her civic duty. After they have left, Arrian suggests using the priest Crane as a character reference. 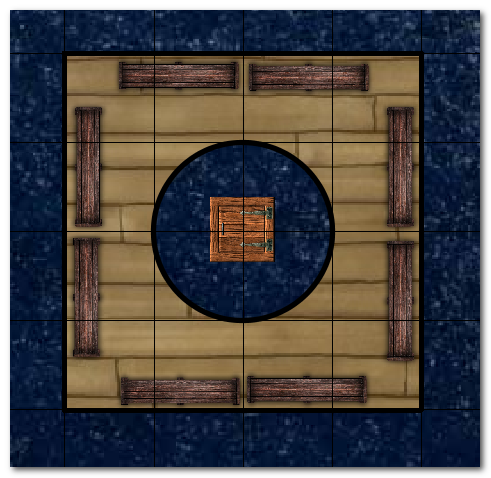 They visit Moradin's temple and ask Crane for a favour. Crane is willing to vouch for Rowaine insofar as he can, and leaves to do so right away. Troll, Shalélu and Ethalyn head back to the library to continue their study. Tomen heads towards Dock 7, saying he is going to stake out the area. Half an hour later Crane returns to the temple, saying that he has done his best. It is quite apparent to him that the guardsman doesn't trust the small group of foreigners, particularly Arrian, thinking that they have have ulterior motives. "Although I would never phrase it as such," Rowaine says in their defence, "you know our ulterior motives, Crane. You know why we are here. However, it is my sense that it is going to take some time. And if we need to spend time to do that then let's spend it doing good." Crane says that the guard are legally unable to hire or instruct people themselves; such an edict must come from higher up. He also advises tact, saying that continual offers of assistance might be taken as insulting. He does confirm that the guard do intend to investigate the lead, either later today or tomorrow. "My hands are tied," Rowaine says, exasperation clear in her voice. "I just hope that they don't walk into something far beyond their ability to handle." "All we can do is be available to guard should they wish it," Arrian says, "and carry on with our own mission." Rowaine briefly returns to the Roasted Goat, tells the proprietor where she will be and heads back to her temple. Arrian spends the rest of the day serving at the temple of Corellon Larethian. The party gather at their lodgings for dinner - all save Tomen. As the party puzzle over this, a rat jumps onto their table. Arrian notices a scrap of parchment tied to one of its hind legs. He removes it, after which the rat scuttles away. It is a note from Tomen, saying that he will continue to watch at the docks until sundown. Note 1: That last paragraph took about an hour to roleplay! Note 2: The Animal Messenger spell is seriously broken. In the rules as written, Tomen's rat would have been compelled to remain in the same spot for four days with no hope of early release, except perhaps its own death. Over dinner, Troll mentions that he believes he has located another boat. He has found meticulous ship manifests, albeit thousands of years old, that suggest that a boat went into storage and never left. He has managed to piece together where the berth might be in the Aquilla of today. Rowaine and Arrian discuss issues of ownership - who might the boat belong to now? Arrian suggests that since the powers that be have not managed to uncover the vessels to date, that there is no loss to themselves should someone else do so. Rowaine does not think it will be so simple and suggests that Arrian's previous idea might be more practical: presenting the harbourmaster with one recovered boat and negotiating a finder's fee for recovering others. There is no question: the party will investigate. Ethalyn expresses an interest in participating. Troll explains that the spot they have identified is in the undercity, around three hundred feet inboard from Aquilla's bow. Rowaine figures there are two possible routes to get there: somehow access the site from above, or swim there from beneath. It is certainly a trip beyond her ability, if not all her comrades also. Perhaps Lord Fallowhay might be able to help. She and Troll return through Trina's branch and retrieve a certain magical item, wrapping it in cloth for a possible trade. Rowaine walks to the Fallowhay residence and knocks on the door. She is shown in to see the venerable aquatic elf and after pleasantries asks whether he has any means of conferring the ability to breathe water to others. Fallowhay mentions that he might have the odd potion somewhere. He does not normally sell such things, but in light of what Rowaine is doing and who she is, that they might come to some arrangement. Rowaine unwraps the magical trident she has brought, Grazuul's weapon. Fallowhay picks up the weapon, coughs politely then returns it to the table. He excuses himself and returns ten minutes later with a wooden box with twelve cloth-wrapped glass bottles inside. Fallowhay identifies the bottles as Potions of Water Breathing, good for ten hours each. Rowaine accepts the trade, having no idea what the trident is worth but figuring that the potions' utility far outweighs the trident's. Tomen has returned by the time Rowaine makes her way back to the Roasted Goat. The group talk about preparations for tomorrow's journey. After dinner, Troll draws a rough map of Aquilla, pointing out where he believes the submerged berth to be. Above it is a healing establishment. Later, in his room, Troll uses the Pigments to create a second Disc harness. Shortly after sunrise the next morning, the party's preparations are complete and they venture to Aquilla's aft starboard side, neat Dock 7. Troll conjures two Greater Discs and Rowaine slings the harnesses loosely in place before stowing her and Arrian's armour in the backpack. Arrian casts Endure Elements: all but Rowaine receive the boon. Tomen dives into the water, activates his Hat and swims ahead while the others take their places around the two Discs. Rowaine, Arrian, Ethalyn and Shalélu each drink a potion. Rowaine carefully checks that the other potions are safely in her backpack, then Troll gestures the Discs into the water. The cold water initially takes Rowaine's breath away - it is about as cool as a winter dip into the Dorval river that passes her beloved monastery - but she soon acclimatises. Buildings of various sizes jut downwards into the sea, many of them lit. Rowaine briefly thinks about the smooth hulls of the dinghies she has seen, wondering how Aquilla even moves with such an uneven underside. Ambient light recedes as Troll directs the Discs further underneath the huge floating city. Tomen quickly darts away, spying five distinct lit areas above that bear similarity to the two other submerged areas he has previously visited. He ignores them and continues towards the party's destination: an unlit, square-profile building descending at least sixty feet beneath the surface, its sides twenty feet across. There are no visible entrances or exits. Tomen looks around and notices that the structure is not particularly unique, although most others of its size have lit apertures that indicate windows and doors. Tomen swims back and keeps pace with his much slower comrades. Troll's Discs near the structure about a minute later. He stops the Discs near the shallows, then dives down alone. He nears the tower's wall then walks down its surface. Arrian works his way around the surface of the tower, spiralling down. Tomen follows Troll, passing him and looking at the underside of the tower, There is a ten foot wide circular hole in its underside with a ripply surface - there is air above. Tomen swims up inside. The hole opens into an air-filled square room. Tomen climbs out and reverts to his true self. Benches line the walls with hooks spaced above. There is a four foot square trapdoor in the centre of the ceiling, fifteen feet above the floor. There are no obvious doors. Troll's head briefly breaks the surface, takes in the surroundings then drops back down. He commands the Discs to descend. Rowaine looks around but sees no sign of Arrian. She yells out but there is no response. Arrian completes his circumnavigation, just in time to see the Discs disappear into the murk below. He dives down after them. The Discs move beneath the building and rise up through the hole. Rowaine tells Troll that they've lost Arrian. Tomen grabs a rope and dives into the water, changing back into an aquatic elf. He quickly spots Arrian and guides him below. Arrian notices Tomen's altered appearance. "Nice magical device," Arrian comments. Arrian searches the room but turns up nothing of great interest. Rowaine notices no signs, nothing written down and nothing obvious to attract attention. Troll Spider Climbs to the ceiling. There is a latch on the trapdoor. He presses his ear to the portal but cannot hear anything. There is no water dripping down. Arrian casts Magical Vestment upon Rowaine's breastplate, then the two don their armour. Troll tries the trapdoor latch but cannot move it. Arrian asks Troll to lift him up to the ceiling on one of the Discs, directing it just to one side of the trapdoor. Feren joins him. To Arrian's eye, although not showing signs of corrosion, the trapdoor latch looks like it hasn't been used for some time. Neither of the two rogues hear any noise beyond. Rowaine Detects Evil overhead and lets the others know. 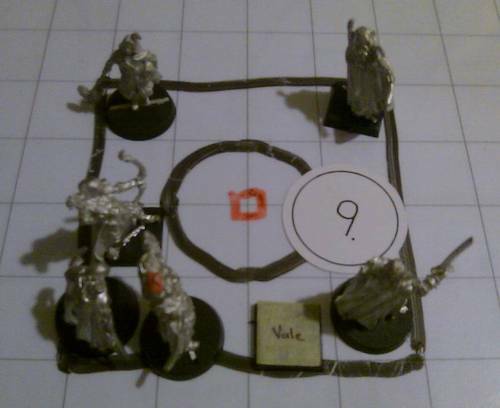 She and the others on the floor draw weapons and take positions around the hole while Arrian tries the trapdoor latch. It is stuck fast. Feren oils the latch and the hinges opposite, then the two pull on the bolt. It moves and the door is wrenched out of their hands under the pressure of a torrent of water. The water level isn't rising - yet. Arrian and Feren see something slip down in the deluge: something large and snake-like. Rowaine does not see it as much as feel it streak past. It is possibly the worst evil she has ever felt. Arrian casts Magic Circle centred upon himself. Troll Detects Magic, noticing that the water level is kept down by mystical means. A snakelike creature bursts out of the hole below, fighting against the torrent beating down on its upturned, fanged head. Five weapons slash at the creature: Rowaine's, Feren's and Ethalyn's score hits but it is not enough to stop the creature's trajectory. It stretches to the ceiling, its jaws crunching its target: Troll. The creature drags Troll's limp form off the roof, its jaws working to swallow its intended meal. Arrian casts Recitation. Tomen bullrushes the creature, trying to prevent it from escaping. The snake whips its skull around, bludgeoning Tomen into the wall behind. Shalélu tries the same but chooses her moment, using the snake's own momentum against it and pinning it against the wall. Rowaine sees Troll, loose in the creature's jaws. She times its gulps, thrusts her mailed hands between its widening maw and wrenches Troll's dead weight out of its throat, depositing him at her feet. "That's no snake", Rowaine thinks to herself, remembering the Dorval river. "That's an eel!" Feren feints a rapier stab from the Disc above, then lines up his true thrust but his weapon's tip is turned by the creature's tough hide. The eel, frustrated at its loss of a meal, snaps at Tomen and rips his arm open. Tomen almost collapses from blood loss. Arrian's Searing Light touches the creature's flesh and burns. Tomen stabs once, twice, thrice and again but his strength has left him. Shalélu draws her short sword but cannot mark her target. Rowaine Lays Hands on Troll, reviving him. The eel tracks Feren's every move but its faith in its tough hide proves unwise as Feren's blade digs into its flesh. It bites again at Tomen, but is distracted by Feren. Troll splatters Acid upon the eel's coils. "If you guys all leave, it would be a lot easier!" he yells. Arrian sees Tomen on wobbly feet and jumps off the Disc. He takes two quick steps on the eel before landing next to his badly wounded companion. The eel lashes out in ire, savaging Arrian's side but he remains on his feet and manages to Cure some of Tomen's injuries. Ethalyn's long sword stabs into eel flesh. Tomen's wounds close but his strength lags behind; his four attacks still lack stopping power. He notices the splashing his steps make; the room is slowly filling up. Shalélu buries her short sword into the creature's side. Blood drips from the removed blade. "Move to the far walls so I can cast my spell!" Troll yells. Rowaine nods then turns to her enemy. "I crush thee against Moradin's anvil, foul beast!" Her imithrium waraxe smites deep, and then bites again. Rowaine gives ground, moving away from Troll. Feren steps so he flanks the creature. His first stab slides deep into the creature and stops in bone, making it hard to remove and spoiling his next attack. The eel clamps down on Arrian's leg, mauling him and refusing to let go. Arrian ignores the pain and casts another Searing Light that chars the eel's skin. Tomen clicks his heels together and blurs into action. The others can barely make out the path of his blades, much less the eel who relies on its natural resilience to save it. Tomen still strikes three times for terrible injury. Shalélu cannot breach the eel's skin but Rowaine can. Her first smiting blow hits hard but her backswing glances off. She steps backwards against the wall. Troll checks that the area is clear then intonates his incantation. He feels his skin burn hot for just a moment before fiery energy blasts outwards, consuming oxygen and eel flesh alike. The eel wilts to the ground, releasing Arrian before its head slaps hard onto the timber floor. 161 damage to the eel in the last round, 246 damage in total! Everyone gasps the oxygen-depleted air, the heat burning their windpipes. Troll grins, then a cracking noise behind him changes his expression. Holes and cracks in the timber walls let in streams and sheets of high pressure water. "Out!" cries Troll. "Out NOW!!" Arrian and Rowaine each jump on a Disc and wind their arms into the harness netting, knowing that their armour will likely kill them should they attempt to swim. The others haul the eel's head and upper body off the floor and down through the hole. As soon as it is clear, they dive in behind it. The eel's carcass slowly spirals downwards. Tomen drags Troll clear and his Discs follow. They have not travelled thirty feet when whump, the bottom level of the tower implodes. After the rubble has dissipated Troll and Tomen gingerly swim back to the remains of the tower's lower level. Only fragments of the walls remain. The benches and the floor are simply gone. The ceiling is now the new floor, the open trapdoor having survived the destruction. Water flows neither in nor out through the trapdoor.